In this bloody day we had to suffer the lost of 240 martyrs with over 170 wounded .. moons have ascended from the land of #Swaida to the sky, another pure souls from our beautiful country, another innocent lives were taken brutally on the hands of the most odious monsters in the world, #ISIS terrorists were hidden in the western desert of #Tanf area (under the noses of the #US military base), have launched a massive attack with more than 600 terrorists at 3:50 am. The attack was carried out on several villages in the eastern countryside of Swaida province in conjunction with 4 suicidal bombers who exploded themselves in a building under construction, a vegetable market and two public squares, while the Popular Armed Committees manged to stop the 5th bomber and capture him to be hanged later that afternoon in front of the #National_Hospital (where he was going to bomb himself) with two ISIS attackers were also captured alive. The attackers divided themselves into several groups of 30 to 50 operatives armed with machine guns and explosive belts, as well as other groups equipped with snipers and mortars, deployed on the outskirts of some villages, they manged to sneak into the villages trough the desert mountain area with the help of some sleeping cells. Door by door, house by house they slaughtered and executed complete families, and kidnapped some others, they attacked unarmed civilians, committed one of the most brutal massacre since the beginning of the #Syrian_War, the villages were ( “Duma”, “Tema”, “Tarba”, “Al-Ksiab”, “Rami”, “Ghiddat Hamayel”, “Al-Shabky” and “Al-Shrehi”). The attackers were faced with hard resistance by the residents and some deployed points of the #Syrian_Arab_Army, most of the first defenders were martyred and wounded till the arrival of the reinforcements from Swaida villages, Jaramana, and #SAA units, many of ISIS attackers were killed, numbers are estimated with about 300 over 80 of them were dragged to the national hospital of Swaida while the terrorists managed take the rest of their dead with them. This day is a living prove of the US collusion with those criminals, this day a living prove of the criminality of the all the terrorism supporters, bu it also the strongest prove of our dedication to defending our homeland. In the map : Orange is the area that was attack, Blue is the area that under the protection of the US military base. In the first video the residents with the Popular Armed Committees are evacuating a family from one of the villages under fire. In the second video the residents with the Popular Armed Committees are securing families in there houses in addition to footage of some the clashes. In the last two videos the residents with the Popular Armed Committees are dragging ISIS killed members. “Rebels” and “moderates” do not exist. They never did. Canada and its allies support the terrorists, as described above, and Syria opposes them. 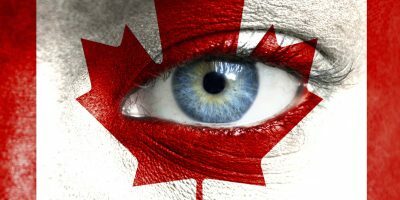 Canada and its allies are committing Supreme International War Crimes, and Syria is defending itself and the rule of International Law. 1. “ISRAEL SHOOTS DOWN SYRIAN WARPLANE OVER GOLAN HEIGHTS WITH PATRIOT MISSILES. ONE PILOT DEAD (VIDEO).” SOUTH FRONT. 24 July, 2018. (https://southfront.org/israel-launches-two-patriot-missiles-at-syrian-warplane-over-golan-heights-video/) Accessed 26 July, 2018. Most Canadians believe the dominant narrative from our controlled, monopoly media. But the dominant narrative is a lie. Russia is not the enemy. We are. 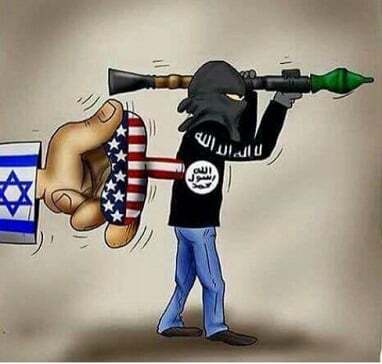 We are the one’s supporting al Qaeda and ISIS in Syria, not Russia. The Canadian government and its agencies extol the imagined virtues of these “first responders”. But we know, and it is well-documented, that the White Helmets are al-Qaeda auxiliaries.2 They stage false flags. They fight alongside their al-Qaeda/al-Nusra Front and affiliated terrorist brigades. The White Helmets are part of a “smart power” complex3 that disguises terrorism and wars of conquest as “humanitarian”. These terrorists are not independent. The West, including Canada4, supports them financially. None of this international criminality will ever benefit Canadians, and all of it is to the detriment of humanity. If Canadians knew the truth, they would not support policymakers who are making decisions in favour of terrorism and never-ending wars of aggression. Canadians need to know the truth. Crimes et délits des médias dominants. 22 July, 2018. ( https://tribunaldelinfaux.com/2018/07/22/le-canada-va-accueillir-des-heros-d-al-qaida-avec-un-lifting/) Accessed 23 July, 2018. 2. Mark Taliano, “The White Helmets are “Black Helmets”, They are Al Qaeda| And Canada Supports Them.” Global Research. 2 April, 2018. (https://www.globalresearch.ca/the-white-helmets-are-black-helmets-they-are-al-qaeda/5634301) Accessed 7 July, 2018. 3. Mark Taliano, “The War on Syria: Driving Home the Truth and the Need to Act Now.” Global Research. 12 July, 2018. 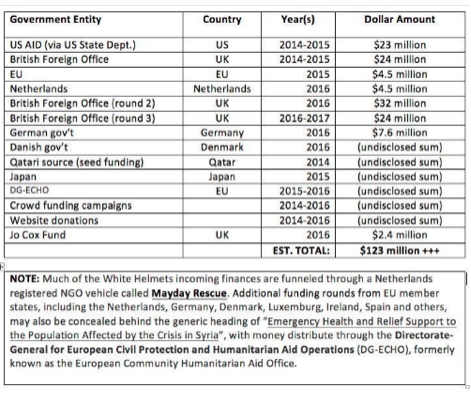 (https://www.globalresearch.ca/the-war-on-syria-driving-home-the-truth-and-the-need-to-act-now/5647214) Accessed 23 July, 2018. 4. Ken Stone, “TRUDEAU GOVERNMENT ADMITS TERRORIST AUXILIARIES TO CANADA.” 23 July, 2018. (https://www.facebook.com/notes/hamilton-coalition-to-stop-the-war/for-immediate-release-hamilton-monday-july-23-2018/2586684938024128/) Accessed 23 July, 2018.